The Veer Chandra Singh Garhwali Govt. Medical Science & Research Institute, Srinagar Pauri Garhwal is a premier Medical Institute established by Govt. of Uttarakhand. The Institute is running full fledged Medical College and fully equipped Multi Specialty 500 bedded teaching hospital. 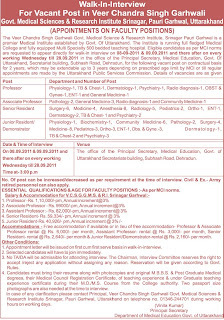 Eligible candidates as per MCI norms are requested to appear directly for walk-in interview on 08-09-2011 & 09.09.2011 and there after on every working Wednesday till 28.09.2011 in the office of the Principal Secretary, Medical Education, Govt. Of Uttarakhand, Secretariat building, Subhash Road, Dehradun, for the following vacant post on contractual basis for 2 years, which may be extendable up to 3 years depending on prescribed age limit by MCI or till regular appointments are made by the Uttarakhand Public Services Commission. 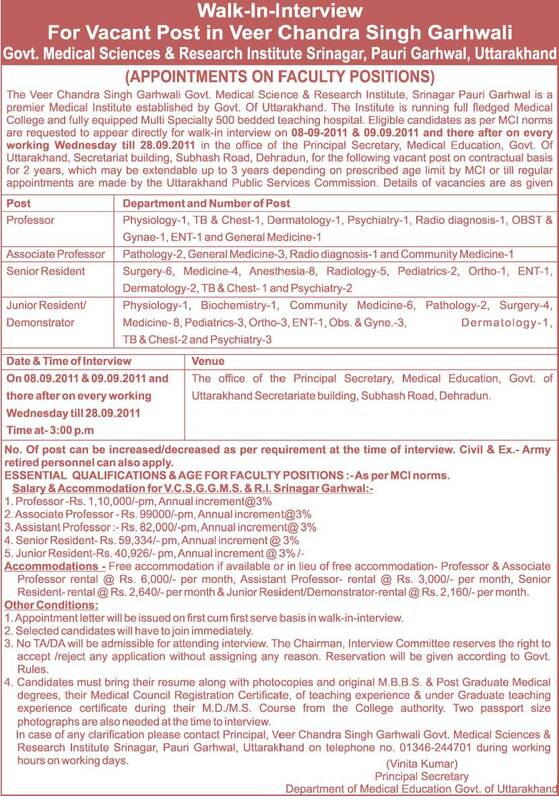 Details of vacancies are as given.